Fintie Introduces this Ultrathin Bluetooth Wireless Keyboard for your Microsoft Surface, HP, Dell Venue 8 Pro, Nuvision 8 and other devices running Microsoft Windows. Press and hold the "Fn" + "Shift" keys while pressing the desired shortcut key. Compatible with Microsoft Windows RT or Windows 8 tablet such as Microsoft Surface, Dell Venue 8 Pro, Nuvision 8, Lenovo Miix 2 and other devices running Microsoft Windows. Sleek and portable, ultra-slim (less than 1/4 inch). 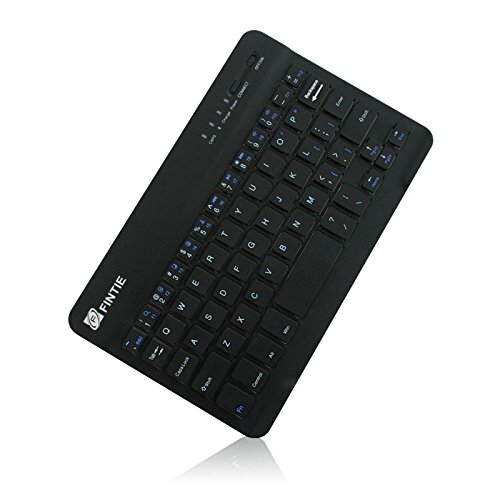 lighter and slimmer than other portable keyboard selling in the market. Real "hard" laptop style keyboard with high end ABS material. A spring mechanism underneath each key ensures a tactile response with every stroke, helping you to type faster and with less error than on a touch screen. Built-in rechargeable lithium battery provides for 100 hours of uninterrupted usage, while auto-sleep feature saves power and ensures you get the most out of every charge.